Because there’s no such thing as too many saddle pads, am I right? Especially if they come in a million colors, are XC shape, and have a built-in half pad. Behold. Also please ignore the fact that my stirrup leathers have literally worn through to their core. 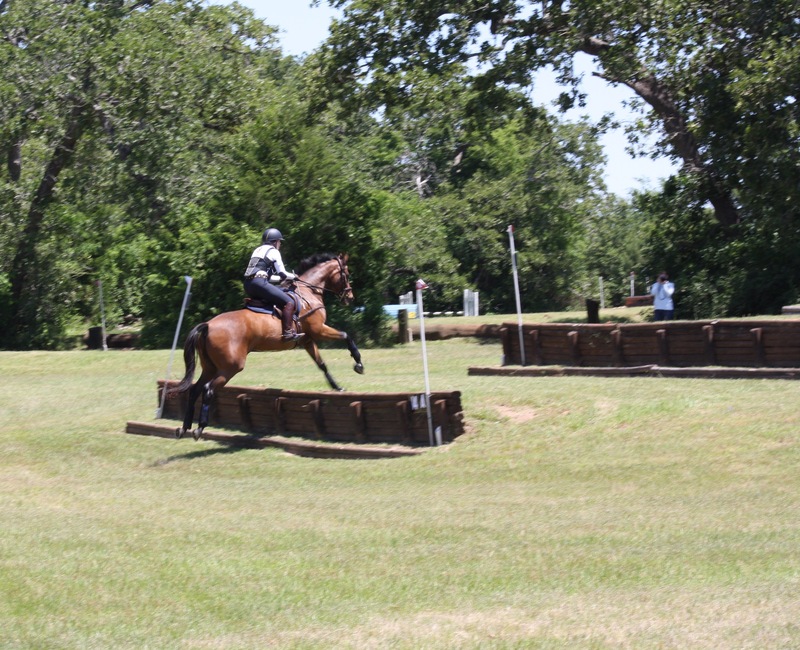 Typically on XC I use my regular jump Ogilvy pad on top of their XC pad, which is more of a euro-cut than a contour. The setup has always worked well for me functionally, but I was interested in the idea of an all-in-one pad, especially in this slightly smaller contoured shape. Because streamlined. JK mostly because lazy and one pad is easier. The Contoured Correction Pad from ECP is very budget friendly and has built in memory foam (Henry’s favorite) shims… I figured it was definitely worth a shot! The shims to me kind of feel a little bit more like a regular foam than the dense Ogilvy memory foam that I’ve become accustomed to… it’s lighter weight and more open-cell than theirs, but it does have a good “spring back” quality to it like you would expect from memory foam. The pad has four pockets total, one in the front and one in the back on each side, and each pocket contains three shims of varying thickness. That’s 12 total shims to play with. Since I was using it as an all-in-one pad, and since Henry’s jump saddle is meant to fit with an Ogilvy under it (ie a bit wide), I left two shims in the front and all of them in the back. Together they make something that is about the same thickness as my Ogilvy. I like having them as shims though, it offers a lot of leeway for fit with a horse that might be uneven or is still growing and changing a lot. It takes all of 2 seconds to just unvelcro the pocket and put shims in or take them out. It would also be very easy to use shims of a different material if you wanted (Thinline devotees, I’m looking at you). The pockets offer lots of options. The shape of the pad fits my saddle (17.5 extra forward CWD) pretty perfectly, and the contoured spine means that it stays up off of his withers. It has a bit of an upward contour in the back too, so it doesn’t sit down on the spine… a problem I had with my PRI contoured pad. Princess Henry has lodged no complaints thus far and has deemed it to be of sufficient padding for his delicate-flower needs. It washes well (take out the shims) and seems to be very well made. The fabric is sturdy, as is the stitching. Plus I think there are a few more that they could probably order for you if you smiled and asked nicely (burgundy and purple?). The price is super reasonable at $55, and I bet you could find a friend *AHEM* that has a coupon code or two floating around somewhere at any given time. ECP also has a dressage pad and a regular square pad too, if you’re not into the XC contour shape. Overall I think that if you’re looking for an economical all-in-one pad, or have a need for something shimmable, this is definitely a good option! I just bought this same pad in the AP style, really like it. ohh great. i have a coupon code sitting here from my last order from RW. I have a dressage pad like this with the shims which I like a lot…. I dont like the PRI (I think you bought one too when I bought one)for the reasons you say. Interesting. And I need a new pad (like a hole in the head) but you can never have too many 🙂 (see how bad an influence you are on me? and you need a green one…. I like this one a lot. Definitely more than the PRI (which I can’t use because it leaves a lump on Henry’s spine in the back!). I like the quilted part better too, its not as stiff. My saddle fitter/bodyworker/wizard LOVES these pads, and since I bought the AP version I have fallen in love, too! She cut custom felt shims for me to put in mine. The shape of the spine of these pads is just great, though – it’s one of the only pads that doesn’t want to shift backwards on my pony! I have the dressage pad and I LOVE the design and the construction, however the dressage pad has quite a short drop and barely clears the flaps of my saddle. I did, indeed, replace the foam shims with ThinLine shims- works great! We still use it often, even if it looks a little comical on Harley. that is what i have the dressage one ( I went and looked and that is the one i have. I ended up taking the shims out due to Remus losing body bulk but at least i have them for when he beefs up. the dressage pad stays surprisingly clean too! I have the ECP shimmable half pad and I like it for all the reasons you hit on in your review. Really nice and adjustable without breaking the bank. Although I went super boring and just got black, haha. you need a jump saddle so you can get the aqua one! ok so then why don’t you have this pad, I don’t get it??? You have a reputation to uphold. I’m sure I’ll be placing some RW orders in the near future. Maybe one will just jump into my cart? HM I AM INTRIGUED. especiallly for the purple. also ECP has a knock off ecogold pad that i LOVE. I have the knockoff ecogold pad too, although I haven’t used it much because it’s white and I live a very navy lifestyle. Cool pad. Sounds simple, useful, and well made. You have a wide CWD? Where did you find that magical creature? I have a 17.5 CWD with forward flaps on trial. I have to decide today/tomorrow whether or not to pull the trigger. My only concern is the gullet width (for my horse). Just curious what your model/configuration CWD is. Nope it’s not a wide, I said it fits Henry a bit wide. 😉 The Regular/Medium CWD tree fits like MW, which on Henry means it’s just wide enough for a half pad under it. As to your concern – CWD’s gullet is very wide… do you mean the tree width? I was thinking about getting one of these, but they didn’t have red. I should remember that RW will get other colors. I wish they had a hunter pad like this. Great concept with all the shims that it COMES WITH! And the price point is right on too. I was thinking that too, I’d like a fleece hunter pad for foxhunting! I wonder if this would work with my Prolite shims. I may just have to order one and try it out next time I order from RW. I need breeches anyway. Just ordered this! Super excited to try it. I just love your reviews…. Can you please review stirrup leathers??? I really need new ones and just cannot decide what I want for my jumping saddle. They have a dressage pad? Sign me up! I need something that has a flexible fit for my growing babies.